June 27, 2013 - Boeing received FAA approval to fly Required Navigation Performance Authorization Required (RNP AR) procedures on the 787 fleet. Operators that fly RNP AR procedures significantly reduce fuel burn, emissions and airport congestion by flying precisely along a predefined route using advanced on-board navigation systems together with GPS based global navigation satellite systems. As an FAA approved RNP application service provider, Boeing can now offer 787 customers full support as they apply for approval to use RNP AR procedures on their fleets. "This approval enables us to help Boeing customers realize the full potential of their 787s," said Mike Caflisch, director, Airspace Programs, Boeing Digital Aviation, Commercial Aviation Services. "Our extensive experience in obtaining RNP AR operational approvals allows us to help customers move through the rigorous RNP AR operational approval process more efficiently, giving them a competitive advantage in the marketplace. In the long run, all industry stakeholders benefit as more airlines derive fuel and operating efficiencies via RNP, the overall efficiency of global air traffic improves and the environmental footprint is reduced." Achieving regulatory approval requires an airplane operator to demonstrate that they have airplanes equipped to fly narrow GPS guided RNP AR flight procedures requiring accuracy down to as little as one tenth of a nautical mile, training in place for flight crews and dispatchers, the ability to ensure sufficient GPS coverage for the planned route at the planned date and time (RNP availability prediction), flight crew operating procedures, the ability to ensure that RNP navigation charts and databases are accurate and current (navigation database validation) and flight procedures designed and in place. Boeing RNP AR application services are already available to operators of Next-Generation 737s, Boeing Business Jets and 777s. The Boeing 787 Dreamliner is a long-range, mid-size wide-body, twin-engine jet airliner. Its variants seat 210 to 330 passengers. Boeing states that it is the company's most fuel-efficient airliner and the world's first major airliner to use composite materials as the primary material in the construction of its airframe. The 787 has been designed to be 20% more fuel efficient than the 767 it is to replace. 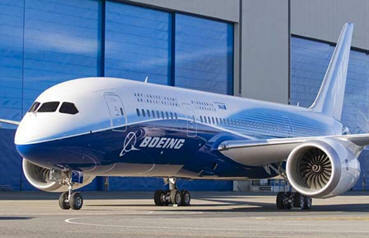 The Dreamliner's distinguishing features include mostly electrical flight systems, a four-panel windshield, noise-reducing chevrons on its engine nacelles, and a smoother nose contour. It shares a common type rating with the larger 777 twinjet, allowing qualified pilots to operate both models, due to related design features.